Donald Trump's promises to unleash massive infrastructure spending and gigantic tax cuts seem to be spooking the bond market. Lost in the post-election stock market euphoria is the fact that the bond market has suffered a dramatic wave of selling that is rare in recent history. It's sent interest rates on U.S. bonds spiking, making it more expensive for the federal government to borrow money. The rate on 10-year Treasury notes has surged to 2.3%, from 1.77% before the election. 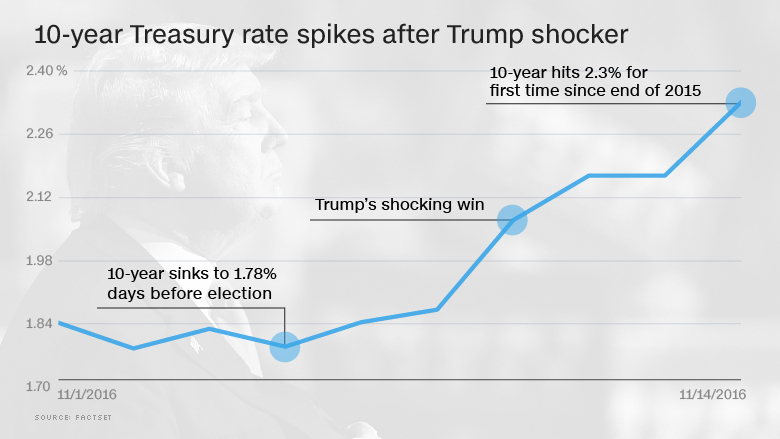 Last week's spike in Treasury rates was so big, that it had only happened three times before in the last decade. BlackRock's Russ Koesterich called it a "violent reaction." 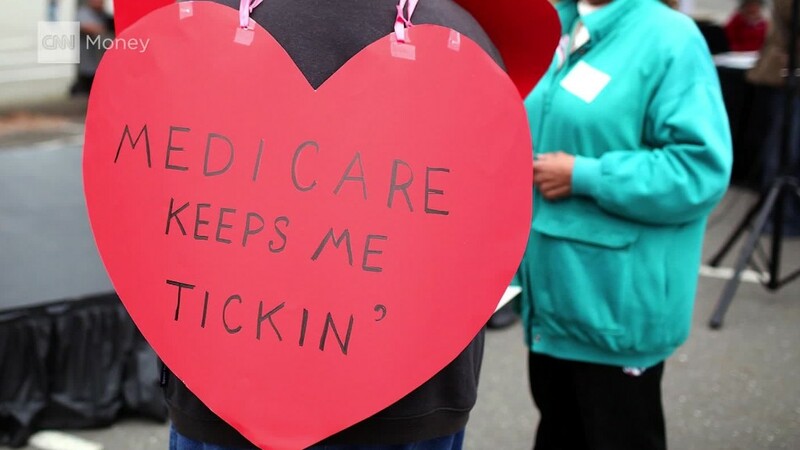 The move stands to have broad repercussions for all Americans. Not only will the U.S. government have to pay more to borrow money, but mortgage rates and car loan costs should also rise. That's because Treasuries are used as the benchmark for many other forms of credit. The bond market's reaction shows investors believe Trump's plans will add to America's already-massive debt load and cause inflation to rise. Spending concerns: Trump has pledged to give the American economy a shot in the arm by spending heavily on infrastructure. "We are going to fix our inner cities and rebuild our highways, bridges, tunnels, airports, schools, hospitals," Trump declared in his victory speech. That pledge has been great news for infrastructure stocks like Caterpillar (CAT) and U.S. Steel (X). Trump's win has also sent defense stocks like Lockheed Martin (LMT) flying higher because he wants to ramp up military spending. But the bond market is concerned about whether America can afford all of that spending. "The federal budget is already dangerously out of balance," David Kelly, chief global strategist at JPMorgan Funds, wrote in a note on Monday. Debt worries: On top of heavy spending, Trump has promised massive tax cuts that would reduce revenue by $7 trillion in the first decade alone, according to the Tax Policy Center. The Committee for a Responsible Federal Budget estimates Trump's fiscal plans, especially the tax cuts, would cause the U.S. debt to soar to 143% of GDP by 2026, compared with 104% today. "The truth is boosting the federal debt to these levels is fiscally reckless," Kelly wrote. That partly explains why the 30-year Treasury rate topped 3% on Monday for the first time since January. Inflation back from the dead? Investors are also bracing for Trump stimulus to carry inflation out of the post-crisis doldrums. Prices could also rise if Trump's anti-trade stance means more goods are made in America, according to Ed Yardeni, president of investment advisory Yardeni Research, wrote in a note. "The bond market seems to be raising the odds of Trumponomics' inflationary consequences," Yardeni wrote in a note. Fed rate hikes: Rates are rising because many anticipate the Federal Reserve will hike interest rates next month for the first time in a year. If Trump's policies end up causing growth and inflation to tick up, it could cause the Fed to raise rates faster than previously planned. Fallout: It's possible the bond market reaction is overdone. Much will depend on what policies Trump actually pursues -- and how much support he gets from the Republican-led Congress. However, if bonds continue to sell off, the consequences could be profound. Higher rates will make it more expensive for the U.S. government to finance its increasingly-large debt load. Bespoke Investment Group warns "soaring" Treasury rates signal a significant jump in mortgage rates that on top of rising home prices could hurt the housing market. So far, the stock market hasn't seemed too concerned by the rip higher in bond rates. But that may change. After all, extremely low interest rates helped fuel the stock market's rise over the past seven years. By contrast, higher returns for risk-free Treasuries may make investors think twice before betting on risky stocks. Continued selling in the bond market could also mark the end of the decades-long bull market in bonds. BlackRock's Koesterich said absent a "pretty catastrophic shock" to the global economy, bond rates likely bottomed earlier this year. Walter Zimmerman, senior vice president at United-ICAP, argues the "historic bubble has burst" and warns that selling could be dramatic. "No speculative bubble in history has ever slowly leaked out," Zimmerman said.